Imagine this: you write a blog post, then hit publish, and voila — hundreds of comments, shares and email sign-ups from just one blog post! Now imagine this happening every single time you publish a new blog post! One can always dream, huh! You see, blogging is hard. Creating quality content consistently is one of the hardest challenges a blogger faces every single day. And if you’re a brand new blogger? Uhh… what can I say, except that, you’ve got work to do, my friend! With that said, today I’ll show you a pretty neat trick to come up with content ideas that’ll be popular with your audience every single time, WITHOUT FAIL! How do I know? Well, keep reading to find out! OK, I know I’m being overly dramatic, but I mean it when I say that you’ve got to work hard if you want 1) traffic 2) sales 3) dedicated readers 4) email signups on your blog. And yes, you need all the aforementioned if you want to be a successful blogger. So, here’s the thing. There are two ways to work hard. Work hard without knowing what you’re doing, or, work hard smarter knowing exactly what goals you’re after. Now, I’ve already promised you to share a trick with you to come up with popular content every single time. If you’re wondering how I can be so sure, well, hold your horses. I’ll explain everything! Let’s brainstorm for a bit, shall we? If I asked you how you (as a newbie blogger, assuming that you are) would find a blog topic that’s guaranteed to be popular with your ideal audience, what would your answer be? Let’s see… if I’m not mistaken, at least a few of you have thought about asking your ideal audience what they want to read about, am I right? That’s a fantastic idea! But here’s the catch. As a newbie blogger who has neither massive traffic nor a gigantic email subscriber list/social media following, how do you go about asking this ideal audience you speak of? If you had that kind of audience, you’d likely be a successful blogger already. But here you are, brand new blogger still green around the edges, with no audience to speak of. How do YOU go about finding a sure-fire popular topic? Wanna know how? It’s so simple, it’ll blow you away! You steal popular topics from your competitors! Yes. I just told you to steal, and you know what? I’m not ashamed in the least bit to admit it. I’ve done it myself, and guess what? Every single blogger out there has done it at one point or another. Including the big shots. ESPECIALLY the big shots! That’s the beauty of the blogging world. We’re all really talking about the same things. It’s not the topic that needs to be unique, but the message (in fact, the message isn’t entirely unique either, only, how you present it!) DO NOT go plagiarizing the message (as in, the content of your blog post), but as far as the topic is concerned, STEAL AWAY! 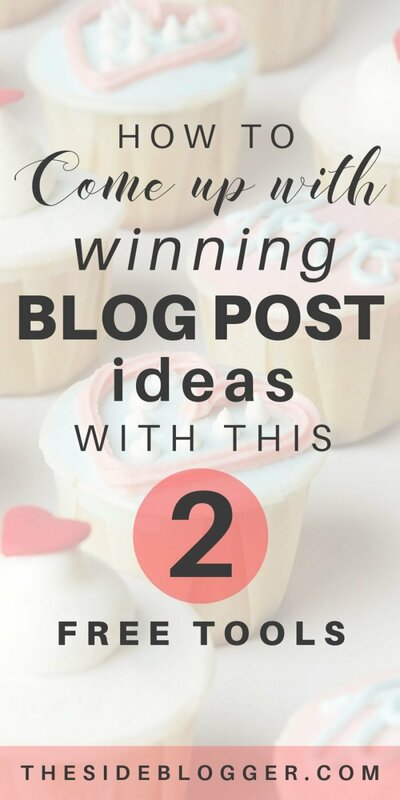 And now, in the rest of this post, I’ll show you EXACTLY HOW to steal the most popular topics from your competitors, and EXACTLY HOW to fashion content for these topics in a way that’s uniquely you, so that your brand new audience will gobble up and become your loyal readers. Telling you to steal popular topics is easy enough. But in practice, it requires some work. But not to worry! I’ll go over each of these steps. I believe in keeping your eyes on the big fish. Don’t make other small time/newbie blogger your competitor. It’s not worth it. If you want to make it big in your industry, your goal should really be the top brass in your field. For example, I blog about blogging, right? I’m a newbie blogger myself. But you know who I consider my competitors? Blogs like Smart Blogger, Pro Blogger, Copy Blogger, etc. Yes, they’re waaayyy out of my reach. For now. But if I want to make it big in this world, I’ve GOT TO keep my eyes on the real big deals. That’s the ONLY WAY to make it big FAST! These super-big blogs and the bloggers behind them are not only my mentors, but they’re also my rivals. Yep! Here’s the thing: your competitors have competitors. And while you think of these top-shots as your rivals, they’re not even aware that you exist. They’re busy playing in a whole different field with players of their own levels. What you, as a newbie blogger, need to do is find out who these players are. You must know at least two or three bloggers/blogs that are big in your field. Start there, and then find out who their competitors are. And that’s where Spyfu comes in. It’s a tool that’s pretty much godsend for beginner bloggers. This tool helps you get vital information about websites/blogs. Give it a shot, go to Spyfu and type in a blog url in the search bar. See what comes up! And by the way, the screenshot above is only a small part of all the information that came up. This screen has a LOT of data and honestly, as a new blogger you don’t have much use for all the different things. For the purpose of this blog post, we’ll only focus on the section that I’ve boxed in — the part that shows the top 5 competitor blogs. That’s the information you’re looking for. As you can see in the image, it only shows your the first 5 competitor blogs. To unlock more results, you’ll need to sign up for their paid plan, however, at this stage there’s no need for that. The free plan is enough and if we’re smart, we can do a lot with just those 5 names. 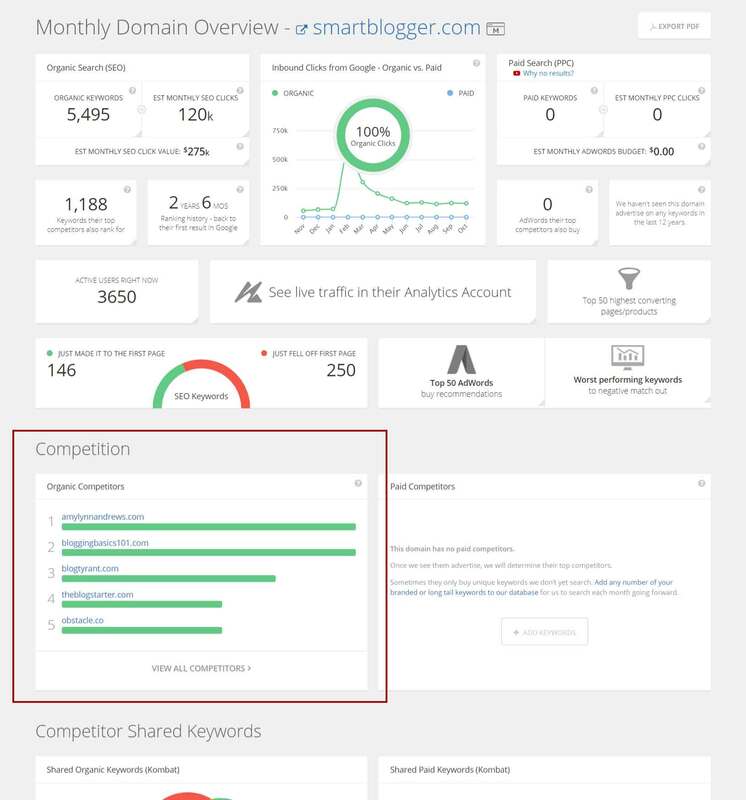 Here’s what you need to do next: use Spyfu to spy on these 5 competitor blogs and find out their competitors. You’ll see that some of the results repeat the same blog names (which is to be expected as they’re all in the same niche, and competitors to one another). In any case, try to come up with 5 – 10 competitor blog names. Jot them down on a paper or enter them on a spreadsheet. Now that you have a list of the top brass in your niche, it’s time to find out the most popular topics for each of these blogs. And you can do that with yet another awesome tool called Buzzsumo. Buzzsumo is a paid tool, but just like Spyfu, it does offer some limited functionalities for free. And as a beginner blogger, that’s really all you need. In the search bar, type in one of the competitor blog URL. 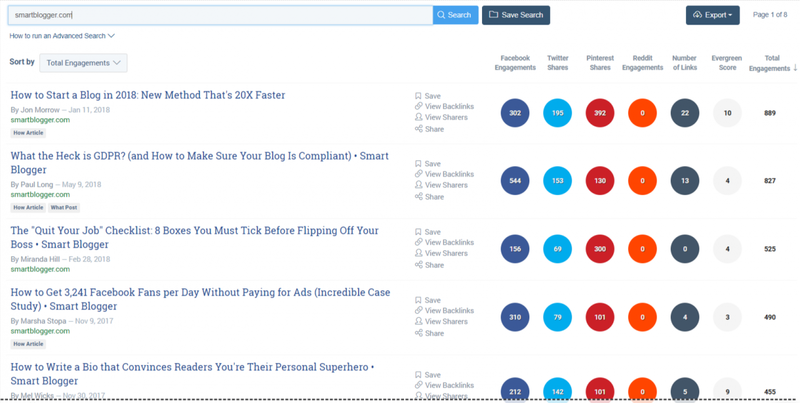 Buzzsumo will then show you some of their most popular blog post titles as well as the number of times they’ve been shared. Take a look at the search result for Smart Blogger. And BAAM! You have your list of popular topics! You see, this is not a game of guesses. This is social proof! You have here a list of topics that are really popular with your ideal audience and the share counts prove that. Repeat the same procedure for all the blogs in your list that you prepared in the previous step. Let’s say you had 10 competitor blogs in your list. 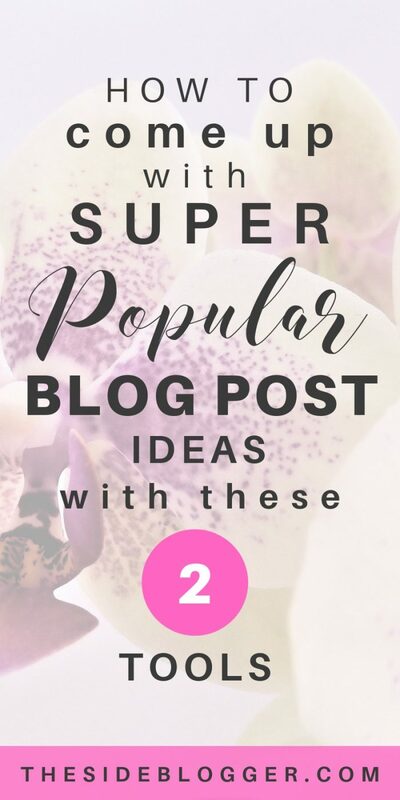 And then Buzzsumo shows you top 5 post topics for each of these blogs (on the free plan), then there, you have 50 super popular post topics that you can leverage to your benefit. Now that you have a list of all the popular topics, it’s now time to create content that’ll blow your audience away. Now, you may be wondering, how do you do that and why would people even care when blogs much bigger than yours have already created pretty awesome content for these topics, right? The ever so notorious “imposter syndrome” rears its head. Now here’s the thing. If you want to be a successful blogger, you cannot entertain imposter syndrome. Start practicing already. The moment thoughts such as “Why would anyone care” comes to mind, kick ’em out. Period. You must train yourself to do that! And then, after you’ve rid yourself of these unnecessary doubts, get to work! The first step is to study what your competitor has to say about a popular topic. And then seek out further information on this topic on Google and Quora, perhaps even Pinterest. Do your due diligence and see what information you can find out there. The idea is to familiarize yourself with the topic as well as possible. You want to serve your readers as well and as thoroughly as possible. The future of your blog depends on it. This is the tricky part, I know. But here I have good news for you. Chances are, your competitor had written the post some time ago, and hadn’t really updated the information in some time. You can take advantage of that, and create a post that’s more up to date. Or, even if your competitor’s post is thorough and you’re sure you can’t beat it, it’s fine. Just write in a way that feels more like you and not your competitor. Do you. I know it’s a corny advice and almost too dated, but really, you make loyal readers out of these chance encounters not only with great content but also with your unique style and personality. Some people will choose to follow you on their own accord over your competitor because they likely find your style more relatable and to their liking. As a (future) successful blogger, you need to capitalize on that. Don’t worry too much about whose post is more thorough. Just as long as you do your best, it’s good enough for you as a newbie blogger. You don’t have to be perfect. In fact, if you try to make things too perfect, you’ll find yourself going down a rabbit hole, and you won’t be able to finish anything. Remember, it’s better to have a good, finished product than an unfinished masterpiece that’s great. Do your best, and know that you can always come back and polish it up afterward. In fact, that’s what most bloggers do. It’s difficult to create unique content year after year. So, chances are you’ll end up repurposing your old blog posts periodically. Pack in more info: See if you can provide more information and create a more thorough post than your competitor’s. More up-to-date content: As I was saying, often you’ll find that a competitor’s post is perhaps not the most up to date. If that’s the case, it’s a chance for you to improve your own content by making it more relevant and up-to-date. Be thorough: If your competitor has a brief description, you can write a more thorough description. For example, if you’re writing a how-to post, see if you can add some graphics to clarify certain steps whereas your competitor perhaps didn’t bother to add images. 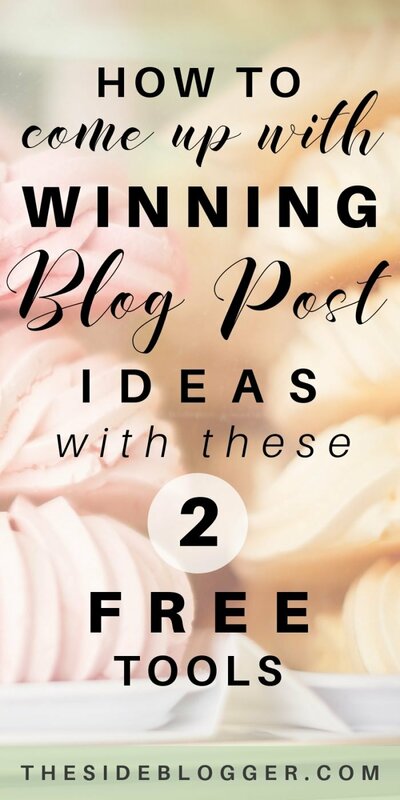 Offer a freebie: This may not apply to all topics, but if there’s a chance that you can pair a post with a free offer (in exchange for your readers’ email addresses, i.e. newsletter signups), do it! Perhaps a relevant checklist or a workbook; readers dig that! This blog post is tailored for beginner bloggers and so, I took some measures to ensure burnout avoidance. However, there’s one aspect, an extra step, that I went back and forth on trying to decide whether to add to this blog post or not. In the end, I feel it’s worth adding. In fact, if you follow up creating amazing content with this one extra step, it will help your blog tremendously, not just now, but in the days to come. It has to do with authority and SEO (short for Search Engine Optimization). Some of you may have heard of the terms SEO and backlinking. Basically, if you can get established blogs/websites in your niche (or in a niche that compliments yours) to link back to your content, it pumps SEO juice to your site, which isn’t lost on Google. The traffic that is generated through these backlinks, back to your content, will help you rank higher with Google over time. You’ve already found out some of the most popular posts by your competitor with the help of Buzzsumo. And now you need to figure out who’s linking to your competitor(s). Enter yet another FREE tool called Backlink Watch. Pop in your competitor’s URL (not just the domain name, but the URL of the specific popular topic that you’ve just recreated) in the search bar, and hit enter or the “Check Backlinks” button. You should now see a list of URLs of other websites/blogs that have linked back to your competitor’s popular blog post. At this point, you can reach out to these backlinking blogs/websites and ask them to link back to your content because you know that they’re already interested in the specific topic you’ve written about (you can tell because they’ve already linked to your competitor’s content). Make sure to reach out to the right sites/blogs. Backlink Watch will return all the URLs that have linked to the specific URL you’re searching for, and often these include forums, duplicate content sites, and other shady sites/blogs. Make sure to do some vetting before you reach out to these folks. Only reach out to legit websites and blogs that appear to have a genuine interest in your content. As for the part where you reach out: it’s easy. Find an email/contact form and send a brief message letting them know what your content is about and why you think they may be interested in sharing your content in their site/linking back to your blog post. I was searching for [topic] earlier and came across your site, specifically this post where you’ve linked back to one of my favorite blogs [or blogger]: [link to their post where the back-link appears]. I figured you might want to share my post on your website/blog. In any case, I’m glad I’ve found you. Keep up the awesome work you’re doing! Now, if you’ve done your part of the work and have written a blog post that’s more thorough and more up to date than your competitor’s content, there’s a very good chance that some of these blog/website owners will be more than happy to link back to your content! This is great for SEO and increases your authority in your specific field. So, here’s the thing guys: this technique isn’t something I just made up. In fact, it’s a legit trick a lot of high-profile bloggers use. It’s called the “Skyscraper technique“. I’ve fashioned this post with the beginner blogger in mind, so as not to overwhelm. However, if you wish to learn more about the Skyscraper technique, you can read about it here. And there, you now have a blog post that you know FOR SURE will be popular with your target audience. All you have to do is get the word out. Promote on Facebook page/groups, Make 3-6 different Pin graphics and pin them on your boards as well as group boards. Use whatever other methods you’ve chosen to get your blog out there. And repeat (with the other popular topics in your list)! If you have questions or thoughts, as always, feel free to share in the comments below. I am not a new blogger but just recently decided to take it more seriously. I am glad I found your post! I never heard of these 2 sites but they will definitely be an amazingly valuable tool. Sometimes it is hard and overwhelming to compete with the big shots, but you made it so much easier and leveled the playing field! I have seen a lot of people give up (and I even put my blogs on the back burner at one point) because of feeling lost in a sea of pros. Hey Dawn, glad this post was helpful to you. It’s easy to lose motivation, but I’ve found out that when you keep at it, blogging does reward. After all, all the pros started out as amateurs too 🙂 Good luck! Awesome tips. 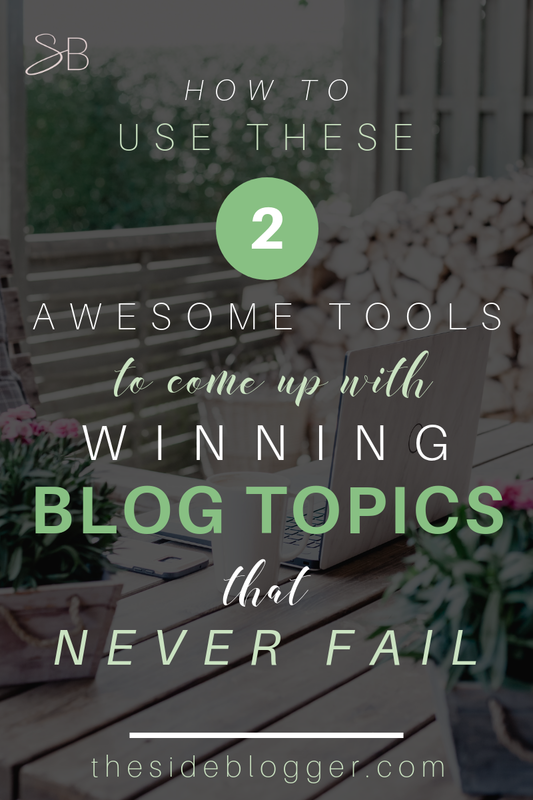 Thank you for this clear help for finding popular topics to blog about! I’ll be pinning this to refer back to. 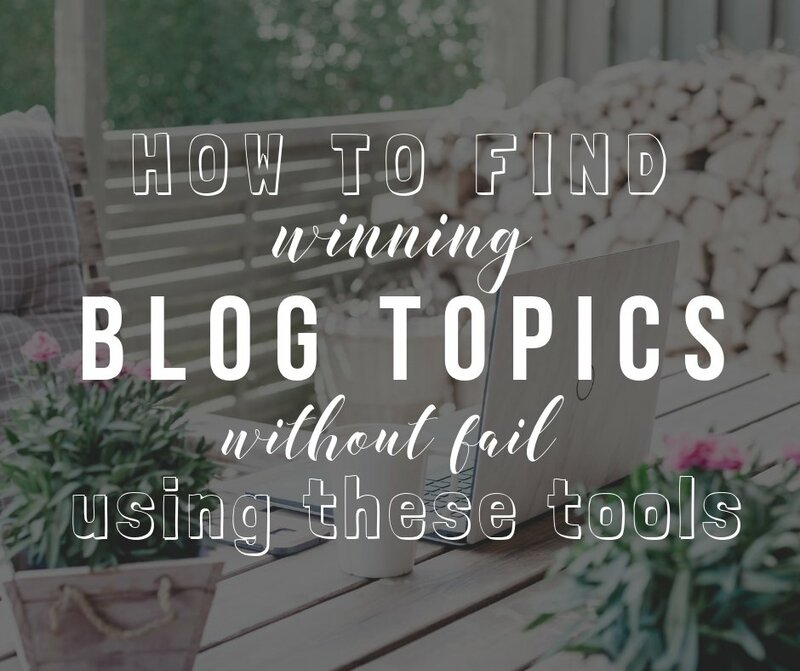 I’ve searched high and low for decent information on blog posts and how to find the topics best suited for myself, and finally I find something that helps. Don’t get me wrong, other posts help but they do not explain it as I’d they were the newbie. It’s more of a sales pitch on some. This was a delight to read. I even laughed at some truth to the commentary. Will be saving this for more reads. Thank you again for taking the time out and creating this content. Hey Dina, thank you so much for your kind words; appreciate it! We’re all just trying to do this blogging thing (and make moolah in the process). I try to keep it as personal as possible and try to be helpful in a genuine manner. That is not to say that I don’t sell and that I don’t have my share of hiccups and overtly salesy pitches… but if some of what I write can be of help to my readers, it motivates me to no end 🙂 So, thank you again for sharing your thoughts. I hope I can continue to be helpful in the future too!